Elementary teacher at Roosevelt/Washington/Jefferson Elementary at North Arlington, NJ. Mod Podge will not dry well in humid conditions. I don't start this project until the school building's heat has been turned on. I have been doing this project for years. The younger children look forward to fifth grade so that they can make their vase. Parents have told me that they still display their child's vase after they have grown. 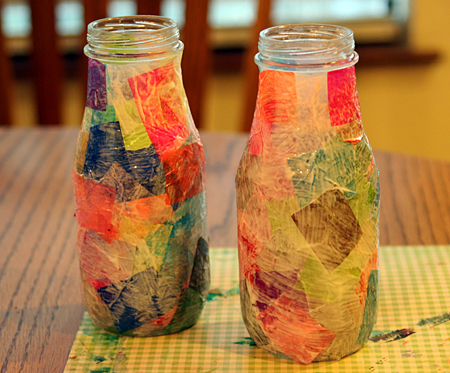 Brush the bottom of the bottle with Mod Podge . Cover with overlapping pieces of torn tissue paper. Brush Mod Podge over the tissue paper. Make sure that the tissue paper is flat. Wrinkles add interest, however, pieces that stick out will harden that way and cannot be flattened once dry. Use enough Mod Podge so that it soaks through the tissue. This makes the tissue paper transparent and gives it a stained glass effect. Build up 4 layers of tissue paper and Mod Podge. Once the bottom of the bottle has been finished, cover the sides and the top in the same manner. Now for the creative part! The children make three-dimensional flowers, vines and leaves to add to their vase. Put on a pair of disposable gloves. This part is very messy. Take a piece of tissue paper about 4"x4" and form it into the following shapes: a thick oval for petals and leaves, a bunched ball for the flower center, and a long twisted rope for the vine. Dip the shape into Mod Podge. Gently work the Mod Podge into the tissue paper while removing any excess. Form into the desired shape and press onto the vase. Attach the leaves and petals so that they stand out. Turn the vase while working so that you can view the overall 3-D effect.